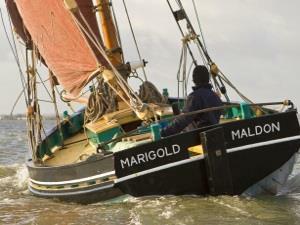 Marigold Charters offers sailing adventures on and around the river Blackwater. Their vessel Marigold is a Gravesend Bawley built upon the lines of the Lillian in 1869. You can book a tide trip (3-4hours) or a day sail (10-12hours) as a private charter for up to 6 passengers. Or join them on one of their advertised public sails.